Friday August 17, 2018 - A section of Bungoma County MCAs have called for the arrest of Bungoma County Speaker, John Mosongo, over corruption. 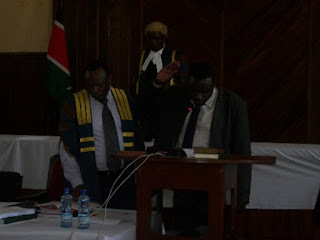 Addressing the press on Friday, the MCAs led Soysambu/ Mitua MCA Stephen Wamalwa alleged that the Speaker has been making factious payments with an aim of stealing public money. Wamalwa cited an example of the payment of Sh510, 000 to a Kisumu hotel for a seminar said to have taken place from December 7 to 12, 2017. He said MCAs found out that no such seminar took place when they reviewed their diaries. “We didn’t, but the hotel was paid,” he said. When contacted, Mosongo confirmed that the payment was false but said staff may have colluded with suppliers. But Wamalwa insisted that the Speaker’s is behind the scandal and he should be arrested. “This is a well choreographed plan that involves particular contractors and suppliers who are paid for doing nothing and thereafter the money is shared," Wamalwa said.